Dr. Muzaffar is the best dentist I have ever seen, and I've been to more than a few! She is professional,caring, and very careful to do her job well and to your liking. Dr. Muzaffar is the best dentist I have ever seen, and I've been to more than a few! She is professional, caring, and very careful to do her job well andto your liking. Dr. Muzaffar is an amazing, caring and well-trained dentist. She shows upmost interest in your well-being versus the questionablesales practices of some other dentists. She keeps you well-informed of the work that she recommends and performs, and has a high regard towards patient sensitivity when it comes to having tools in your mouth. She is, by far, the best dentist I have seen. Dr. Muzaffar is an amazing, caring and well-trained dentist. She shows upmost interest in your well-being versus the questionable sales practices of some other dentists. She keepsyou well-informed of the work that she recommends and performs, and has a high regard towards patient sensitivity when it comes to having tools in your mouth. She is, by far, the best dentist I have seen. 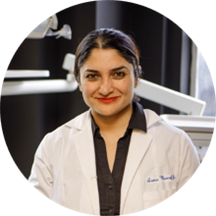 Based in New York, NY, Dr. Asma Muzaffar works at Truth and Laughter Dentistry. Dr. Muzaffar completed her dental education at the University of California, Los Angeles. She continued her training by completing her residency in general practice at Woodhull Medical Center. She also completed her externship in oral surgery at the same medical center. Her primary clinical work involves dentistry. Patients see Dr. Muzaffar for a variety of reasons, including teeth whitening, dental cleaning, cavities, veneers, and fillings. She is a member of the New York Academy of Medicine, the American Society of Clinical Hypnosis, and the International Academy of Oral Medicine and Toxicology. She is multilingual in English, Hindi, Urdu, and Kashmiri. When she is not busy seeing patients, she enjoys swimming and pottery. Dr. Muzaffar exhibits her passion for dentistry in the care and precision she takes with her patients. During her consultations, she explains patients’ conditions and helps them choose an appropriate treatment plan. I haven't been in constant care of my teeth for lack of confidence in City dentists. Dr. Muzaffar is honest and delivers on your expectations. I'm quite confident that I found a professional that accommodates my needs and performs exemplary dental work. Dr.Asma was so wonderful! Easily the kindest and most skilled dentist I’ve had the pleasure of seeing. I look forward to my next appointment! Dr Muzaffar is wonderful! She made us feel extremely comfortable, created a well thought out plan for us and was just lovely in general! She was the most caring and understanding dentist I’ve ever been to. She is great for people who have dental anxiety and makes you feel at ease. Her staff are pleasant and caring! She is the most amazing doctor I’ve ever met - hands down. She cares about your comfort and pain more than even you would! I was in a lot of pain after getting a crown and needed a root canal, Dr.Muzzafar was off and opened her office on Xmas just to see me!! Highly recommend this angel of a dentist to everyone. A genuinely pleasant experience. The Doctor was friendly, kind, easy to understand, and I felt like I was in expert care the entire time. I am actually looking forward to the next appointment. I am typically pretty nervous about going to the dentist, but Dr. Muzaffar was amazing. She made sure I was comfortable the entire time and offered me the option to choose the music in the room, or put in some meditationtapes that she had. She talked me through everything she was doing before she did it, so I knew what to expect. Usually a dental cleaning seems to take forever, but I found this one to go very quickly since I wasn't uncomfortable. I highly recommend her! Excellent doctor, very attentive, gentle, and professional. The office is in the great location, clean, and there’s never a wait. I’ve had a cleaning and a filling done and very satisfied so far! Best dentist ever! I had a lot of anxiety and she not only made me feel comfortable, the procedure itself (root canal) was literally painless. Asma and her assistant were extremely kind and made the entire experience pleasurable. They both were very gentle and made sure that I was comfortable throughout the entire process. I would highly recommend Asma, she is the absolute. Dr. Muzaffar made me feel very comfortable. She was very sweet and informative during my visit. Great experience. She is very patient and friendly. Highly recommend! Super personalized; thorough; and put me at ease. Hadn’t been to a dentist in 8 years. Will only work with her in the future. As someone who is extremely fearful of the dentist, Dr. Muzaffar is by far the most comforting, gentle DDS I have ever encountered. Will definitely be visiting her again and highly recommend! Dr. Muzaffar was very professional. Although she was running a little behind, she came into the lobby to introduce herself & let me know she was running a little late & have an estimate of how long my wait would be.I only ended up waiting about 10 mins or less. Her staff is very kind also. Dr. Muzaffar does a great job of making sure you’re comfortable & understand the procedures. Dr. Muzaffar was very attentive and made me feel super comfortable. She saw me right away, and my cleaning went quickly. I highly recommend her practice! Amazing dentist! Pain free shots...I didn't even fell them. Clean, modern office. Modern equipment. As someone who has a complete fear of the dentist, she made me feel very comfortable and in control of what was happening. I appreciate that very much. She also gives a lot of information and advice that not all dentists do. Highly recommend! Attentive, holistic, and puts her patient first. I was really impressed with Dr. Muzaffar. I never had a dentist be so patient and thoughtful with me! She asked about my lifestyle, health, my allergies and preferences, and even my wellbeing goals in life. She is a biological dentist,which I learned means they use much healthier materials and work with the biology of the mouth to create healing. I had some receding gums and she and her dental assistant took the time to measure and record them so that we could watch them over time. Super impressed and glad I found a holistic option for my smile! Dr. Muzaffar is a highly attentive and approachable professional. I walked in to a warm, inviting space when dentists offices can feel sterile (in a bad way) and intimidating. She walks through the entire routine with care and in the spiritof her business- that you’re not doing another routine check up but achieving a holistic and natural state of self care. Highly recommend.